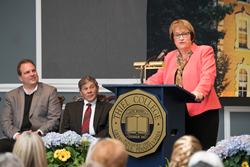 Susan Traverso, Ph.D., was selected as Thiel College's 20th and first female president. She begins August 2016. Thiel College’s 20th president, Susan Traverso, Ph.D., addresses attendees during Tuesday’s press conference. As the College celebrates its 150th anniversary, the excitement on campus is contagious, and I am optimistic that we can accomplish great things together. Susan Traverso, Ph.D., has been named the 20th president of Thiel College. Traverso has served as the provost and senior vice president at Elizabethtown College since 2007. She takes office in August as the first female president of Thiel College. At Elizabethtown College (Elizabethtown, Pa.), Traverso is a senior member of the college’s leadership team and a professor of history. Her responsibilities include strategic, personnel and facilities planning; oversight of the college’s academic and student life programs; coordination of programs, enrollment, financial planning and budget analysis; campaign planning, fundraising and donor relations; supervision of the dean of faculty, the dean of students and seven directors; and engagement with faculty leadership and governance. Traverso co-chaired the Strategic Planning Committee, and chairs the Facilities Planning and Construction Committee and the Hiring Review Committee. Traverso’s significant achievements include coordinating $60 million in campus improvements and advancing fundraising priorities that resulted in external funding of $20 million. Traverso also created an Office of Sponsored Research and Programs, developed the School of Continuing and Professional Studies, and established the Center for Community and Civic Engagement. Previous roles have included dean of the College of Arts & Sciences and associate professor of history at the University of Redlands (Redlands, Calif.); director of the Associated New American Colleges (ANAC) Academy; and associate professor and chair of history at North Central College (Naperville, Ill.). Additionally, Traverso served the U.S. Peace Corps in a variety of roles—including education coordinator and director—in locales such as Morocco, Yemen and Bulgaria. Traverso holds doctoral and master’s degrees in history from the University of Wisconsin-Madison and a bachelor’s degree in history and communications from Simmons College (Boston, Mass.). She has continued her education through a series of leadership development programs in recent years. Traverso and her husband, Kent Taylor, have two children, Linden and Kent. The Thiel College Board of Trustees elected Traverso at their May meeting upon the recommendation of the Presidential Search Committee. The committee began a national search in February under the leadership of consultant Dr. Peter Mitchell and committee chair John Frangakis. Frangakis is the Vice Chair of the Board of Trustees. Traverso replaces Troy D. VanAken, Ph.D., who announced his resignation in February to accept the presidency at Elmhurst College (Elmhurst, Ill.). VanAken has served as the 19th president since 2009 and will continue leading the College through the summer. 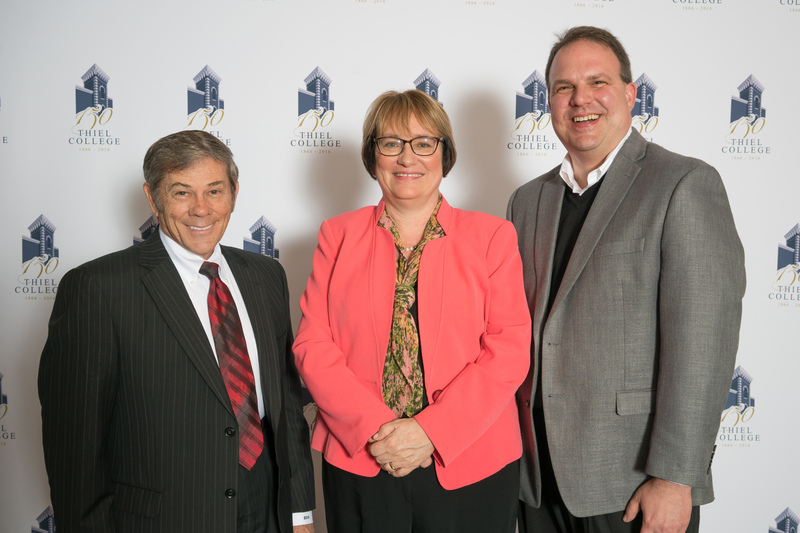 Stamm, Traverso and Frangakis after the event.Thiel College Board of Trustees Chair Barry Stamm, M.D. ’70; Susan Traverso, Ph.D.; and Board of Trustees Vice Chair John Frangakis pose together following Tuesday’s announcement of Traverso as the 20th president. Board of Trustees Chair Barry Stamm, M.D. 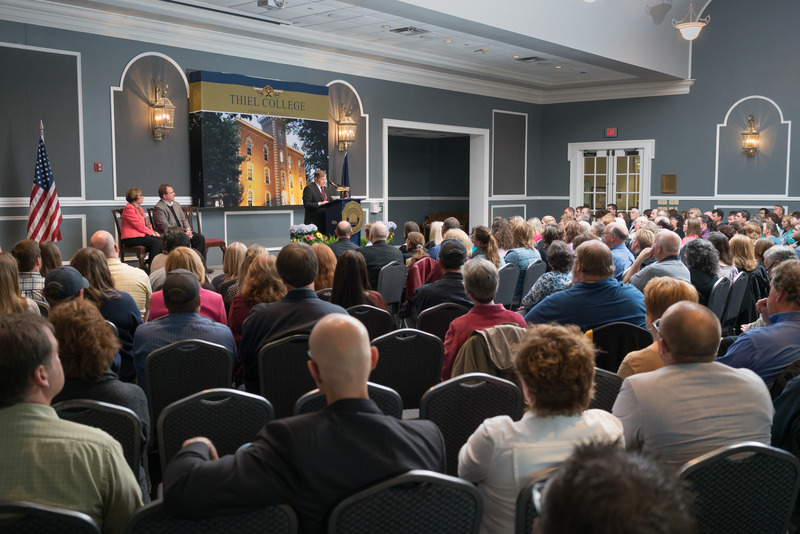 ’70 makes a statement to attendees during Tuesday’s press conference.Susan Traverso, Ph.D., and Thiel College Presidential Search Committee Chair and Board of Trustees Vice Chair John Frangakis look on.